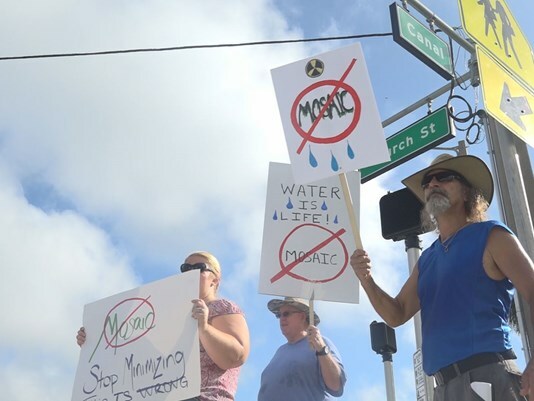 When Mosaic’s phosphate pit opened up three weeks ago and began dumping hundreds of millions of gallons of toxic, radioactive water into the Floridan Aquifer, Mosaic didn’t say a word about it to the public or surrounding communities, even though the contaminated water poses a risk to Florida’s drinking water sources. Mosaic’s excuse: they weren’t legally required to do it. This behavior follows the larger trend where special interests pollute at will while everyday Floridians pay the price. Why? Because big polluters don’t have to worry about state lawmakers holding them accountable. In this case, it’s Rep. Dana Young (R-Tampa), who’s taken tens of thousands of dollars in campaign contributions from Mosaic and the Florida Phosphate Council throughout her political career. But Rep. Young’s relationship with Mosaic doesn’t stop there. On December 2, 2015, Mosaic’s Vice President of Public Affairs went as far as to co-host a fundraising event for Rep. Young at the Tampa Yacht and Country Club. In her time at the Florida Legislature, Rep. Young has voted to take away local authority to enact strong fertilizer restrictions, which would allow more fertilizers to contaminate Tampa’s water. And most recently, she voted for a bill that would have allowed fracking companies to pump toxic chemicals into the ground without disclosure to the public. That bill would have also made it illegal for local communities to ban fracking locally. Rep. Young’s cozy relationship with big polluters like Mosaic shows how out of touch she is with the everyday needs of Tampa’s working families. The fracking bill will likely be back this coming session and with Rep. Young running for a seat in Senate District 18, Tampa voters can make sure she’s not there to give the green light to fracking again. So long as we have politicians like Dana Young in office serving polluters, we cannot trust that our drinking water is safe for Florida families. With regard to holding Mosaic accountable for their actions, Rep. Young has been, you guessed it, silent. Jonathan Webber is Deputy Director of Florida Conservation Voters. FCV started as a coalition of Florida’s conservation community united towards passing Amendment 1, the Water and Land Conservation Amendment. Now our mission is to elect pro-conservation candidates to public office. For more information, visit www.fcvoters.org.